Riverside is a church that loves young people. We earnestly desire that they come to know and experience God’s love and truth from an early age. We have various programmes and facilities available on Sundays aimed at meeting the needs of parents and their children starting with babies and reaching up to grade 5. Children’s Church Values at Riverside Community. Children-targeted: We are reaching children not adults therefore we will do what is best for the children. Safe: Provide an environment where children are physically, emotionally, mentally, and spiritually safe. Relevant: Show children how the Bible is a book filled with the wisdom of God thereby helping them understand and live life in today’s world. Relational: To build a real community for children where they can “know and be known, love and be loved, serve and be served”. 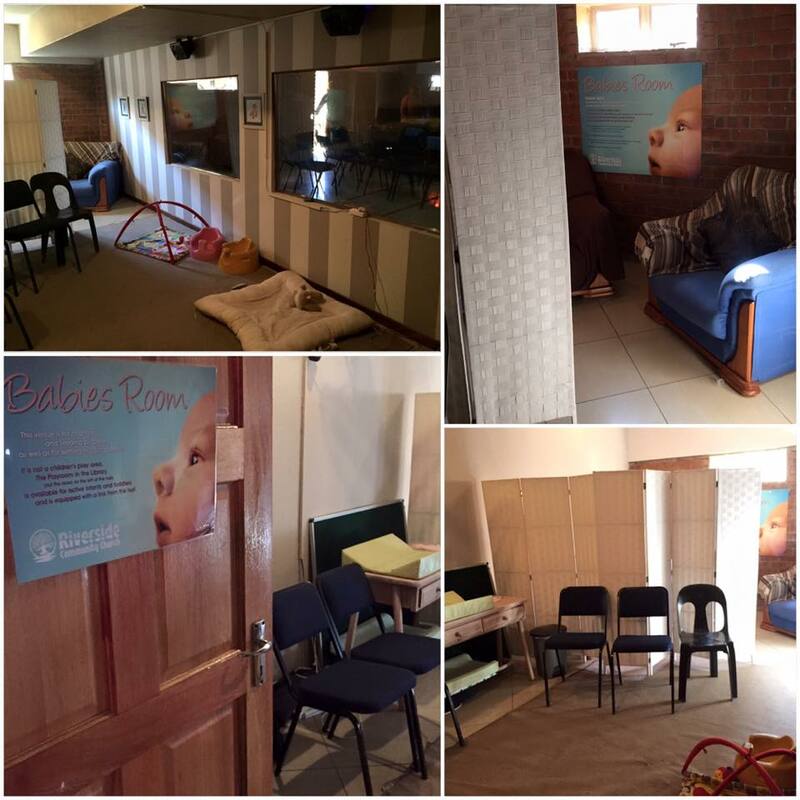 The Baby Room is at the back of the church hall and is for changing and feeding purposes as well as for settling niggling babies (0-6 months). The facility is equipped with an audio feed from the hall so that parents can still enjoy the service. 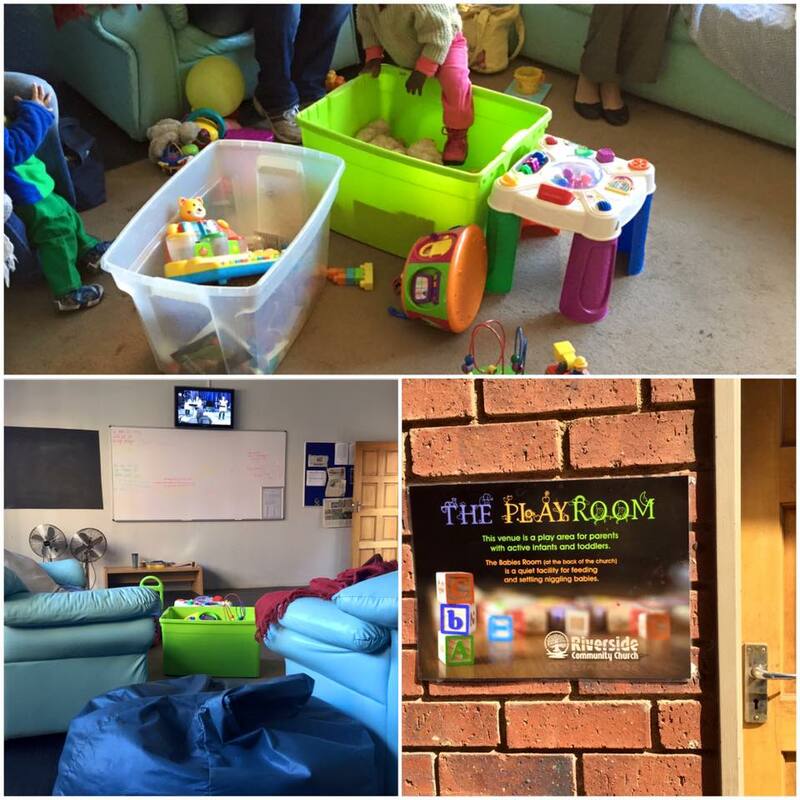 The PlayRoom is out the doors on the right of the hall and is for parents with active infants and toddlers (6-12 months). The facility is equipped with an audio and visual feed from the hall so that parents can still enjoy the service. Buddies Babies: This group meets in the Toddler Room on the right of the hall and is for children ages 12-24 months. This ministry allows for parents to enjoy the main service while their little ones are cared for by a group of loving and capable volunteers. At the same time these little ones are exposed to who God is by enjoying age appropriate activities that reinforce the message of the morning. Buddies is for toddlers ages 2-5 years. They use engaging, age-appropriate activities (song, crafts, Bible stories, etc.) to introduce pre-school children to Jesus. Parents of younger 2 year olds or first time visitors are welcome to stay with their little one until they are settled and comfortable enough to stay on their own. Lifehouse is for grades 0-5. They run a fun and exciting programme – using songs, dramas and small group discussions – teaching kids from the Bible and help them to apply it to their everyday lives. Solid Ground is for grades 6-8. On Sundays the preteens meet from 9:30-11:00 in their dedicated space. 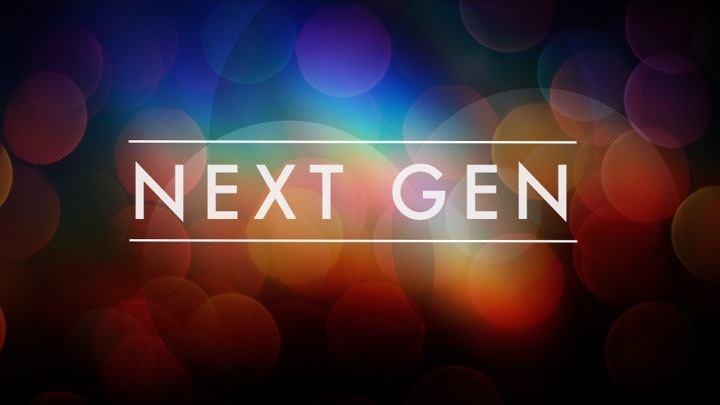 This is for the duration of the main worship service Through interactive discussions various topics are explored, gaining insight and direction from the Bible, making it relevant to their lives, challenging preteens to own their faith. Velocity is for grades 8-12 and is run on Friday evenings, at Grace Trinity (Rietvlei), from 7:30pm. These nights are filled with fun activities and challenges, providing opportunities for friendships to develop. The aim is to introduce young people to Jesus, teaching them about His life and priorities, and helping them to assist others in this process through the Holy Spirit’s power. Use this brilliant Easter Devotional for Families from LifeWay Kids Ministries to make the Easter Season meaningful for your family and engage with your kids about Jesus, his death and resurrection in an age-appropirate way. Keeping families focussed on the true meaning of Christmas, LifeWay Kids Ministries have made available this fantastic Family Advent Guide. This includes devotions based on Hope, Love, Joy, Peace and Jesus; Family Activites; Connections Questions; Daily Reading Plan. Be sure to make use of this great resource to use together as a family with your kids!